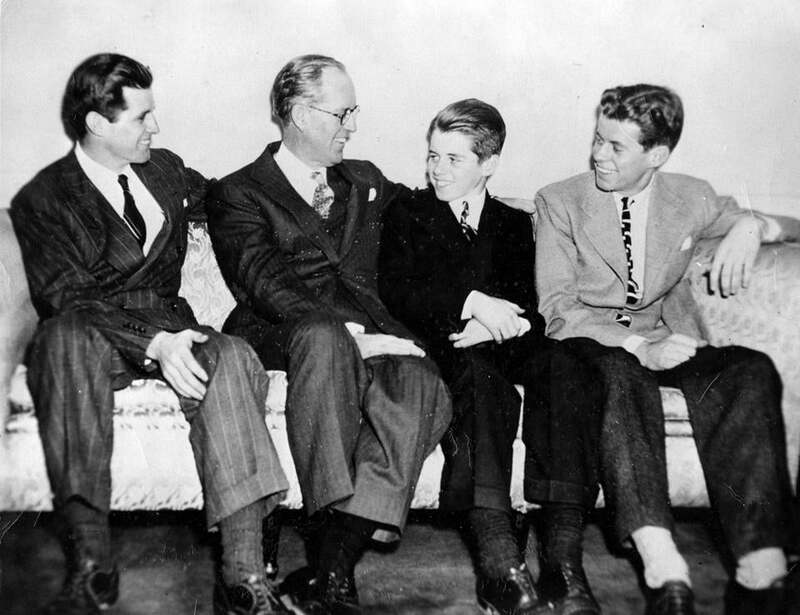 Joseph P. Kennedy, Sr., (second from left) with his sons (from left) Joseph P. Kennedy, Jr., Robert F. Kennedy, and John F. Kennedy in 1938. This 868-page tome traces in meticulous detail Kennedy’s business dealings and his troubled ambassadorship to Britain from 1938-40. It documents how his love for his children, as well as his fortune, helped fuel their political rise, and how deeply he was affected by the untimely deaths of his second-oldest daughter, Kathleen, and three of his four sons by accident, war, and assassination. The book’s principal aim is to sift the facts from decades of myths and rumors about everything from Kennedy’s (undeniable) marital infidelities to his alleged associations with bootlegging and gangsters, for which Nasaw finds little evidence. Without whitewashing the man’s considerable blemishes, “The Patriarch” presents Joseph Kennedy, who died in 1969 at 81, as a “near Shakespearean” figure — a towering, contradictory personality whose achievements were sometimes undercut by his abrasiveness and eventually overwhelmed by personal tragedy. After six years of interviews and poring through Kennedy family letters, unpublished diaries, diplomatic dispatches, and other sources, Nasaw lays out his discoveries in clear, careful prose. What emerges is a portrait of a man who dreamt big and dared greatly, but sometimes stumbled badly. Born in 1888 and raised as “the pampered son” of an East Boston ward leader, Kennedy was an indifferent student at Harvard, more adept at making friends than taking tests. But, fighting his way through a thicket of anti-Irish prejudice, he matured into a brilliant banker and businessman. Timing was his forte. He made his millions in part through canny short-selling and (legal) insider trading when the stock market was largely unregulated, then got out ahead of the 1929 crash, investing instead in real estate. As the first chairman of President Franklin D. Roosevelt’s Securities and Exchange Commission, he later helped regulate the market so others couldn’t commit similar shenanigans. In the 1920s, he also moved aggressively into the movie business, with his Hollywood connections precipitating his most famous affair, with actress Gloria Swanson. During the run-up to World War II, Kennedy charmed Britain’s leaders, becoming close to Neville Chamberlain. Nasaw’s reconstruction of the ambassador’s dealings with the British government, Nazi officials, the US State Department, and FDR is detailed and indispensable. Even as bombs fell on London, Kennedy — fearing for his own sons, as well as other Americans — spoke out against US entrance into the war. By fanning isolationist sentiment, he isolated himself and lost the trust of the president who had appointed him. Contradictions failed to unsettle Kennedy. Throughout his political career, he leaned on the advice and support of Arthur Krock, a New York Times columnist who was Jewish (and who repeatedly violated the ethical canons of his profession to aid his friend). But Kennedy also absorbed and perpetuated the anti-Semitism of his era and social class, disparaging Jews for alleged war-mongering and voicing little concern for the victims of Nazi oppression and genocide. Kennedy’s familial devotion was unquestionable. Nasaw touchingly details Kennedy’s involvement in caring for Jack, the future president, who was often gravely ill as a child and young man. Kennedy spared no expense in educating his mildly retarded eldest daughter, Rosemary, and wrote her — as he did each of his children — tender letters. But, hoping to control her increasingly unruly temper, he made the decision to have her lobotomized — a not-yet-discredited procedure. When her condition worsened as a result, he stopped visiting her, or even mentioning her, excising this particular failure from his life. One of the book’s few weaknesses, perhaps an unavoidable one, is that it fails to shed much light on his rather mysterious relationship with his wife, Rose. The couple seems to have married for love and had sufficient passion to produce nine children. But husband and wife rarely vacationed together and spent months apart every year.